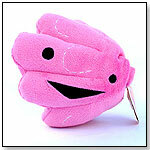 This pink 6.5" x 5.5" mammary gland plush can make a great gift for breast cancer survivors or mastectomy patients. It is safe for all ages and packed inside a biodegradable plastic sleeve. The plush is designed in California and made in China.